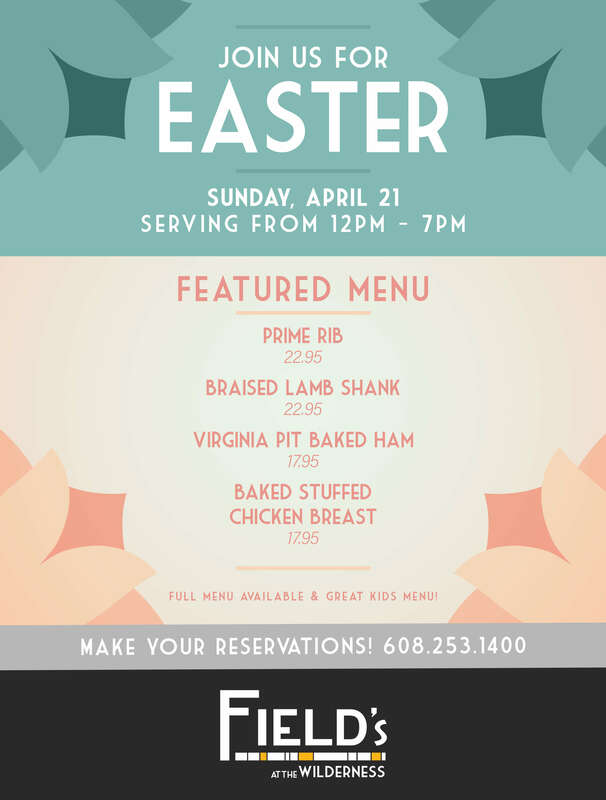 Call 608.253.1400 to make your reservations today! Happy hour appetizers are available from 4-6 pm Sunday – Thursday in the bar and lounge. All drinks are 25% off. A Field's favorite, served with mint jelly. Served with a citrus beurre blanc. Seared Hawaiian tuna served with sautéed onion and bell pepper. Entrees and steaks include a tossed salad & choice of potato or vegetable. Served with Citrus beurre blanc. Your choice with onions, tomatoes, red pepper & cheddar cheese. Roasted red bell pepper pesto & warm olive medley served with toast points. Garlic cream sauce in a puff pastry. Blackened Hawaiian ahi served with sautéed onion & bell pepper. Basil, roma tomato, marinara, mozzarella & parmesan. Basil pesto, artichoke heart, spinach, red onion, kalamata olive & feta. Marinara, spicy Italian sausage, fresh basil, kalamata olive, green bell pepper, gorgonzola & mozzarella. Pepperoni, sausage, prosciutto, mozzarella, parmesan & herbed marinara. Mascarpone cheese, green onion, caper, cracked pepper & smoked Atlantic salmon. Spinach, mushroom & tomato, fontina Florentine sauce. Sautéed shiitake mushrooms, dark veal demi-glace & fresh lemon. Baked in our homemade sauce. 12 oz. panko encrusted, basil dijonnaise. 8 oz., roasted vegetables, fingerling potatoes & garlic butter. Broiled shrimp, lobster & scallops served with risotto & lobster cream sauce (no substitutions please). Bacon, chardonnay, butter & scallions. Gratin, baked, garlic cream sauce & fettuccine. Deep fried with a creamy sweet chili sauce. Roasted red bell pepper, feta, kalamata olive, spinach, tomato & pomodoro cream sauce. Crumbled & creamy Stilton blue cheese topped with curled beets. | $6.95 with entrée. Traditionally prepared. | $6.95 with entrée. Chiffonade of romaine, diced avocado, tomato, bacon, egg, Stilton blue cheese, chili shallot dressing topped with fried potato threads. | $6.95 with entrée. Colorado Lamb - sweet pea risotto and chambord & mint bordelaise sauce. Wilderness Room: Accommodates up to 30 guests. Board Room: Accommodates up to 15 guests. Gallery Room: Accommodates up to 10 guests. 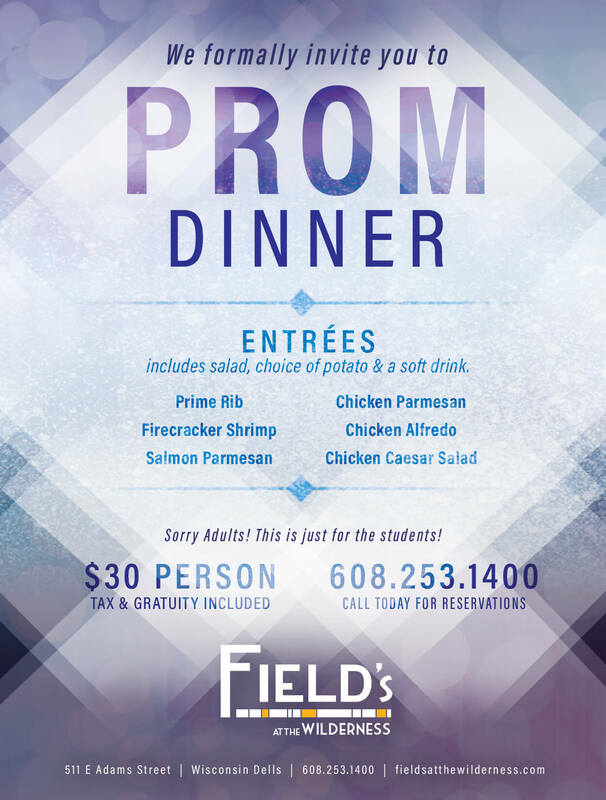 For more information about private dining at Field’s located click here. Call or email with any questions or concerns.